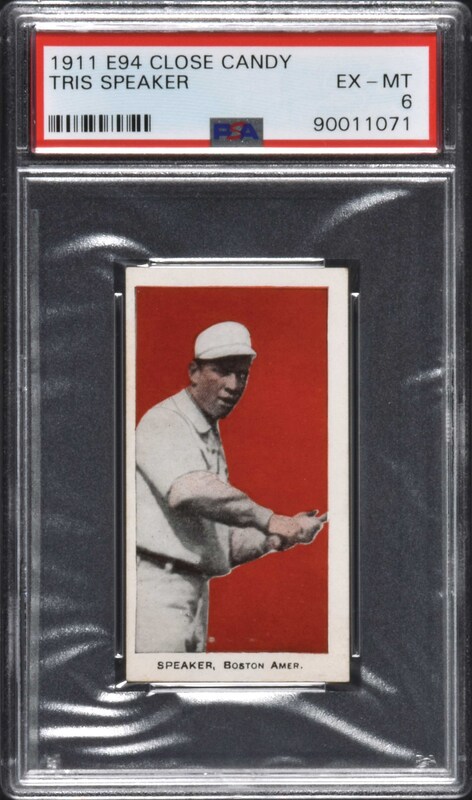 Lot # 189: 1911 E94 George Close Candy Tris Speaker PSA EX-MT 6 - Red Background - Highest Graded! Graded EX-MT 6 by PSA. 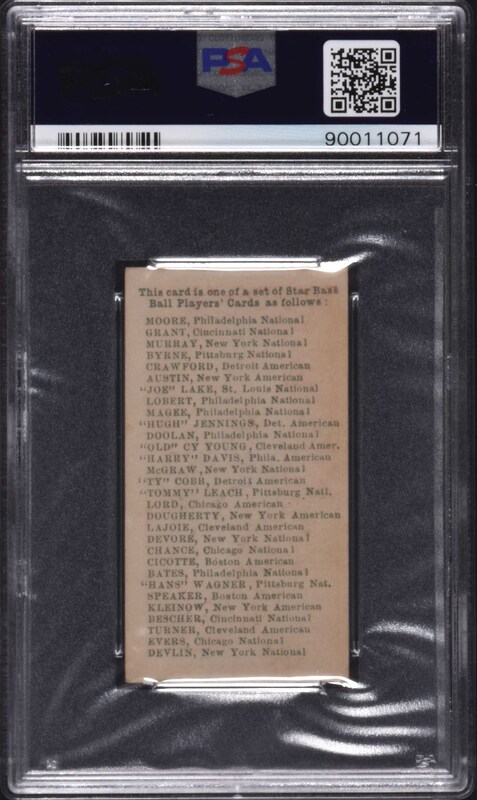 Extraordinary E94 example of Hall of Famer Tris Speaker in extremely high grade with a red background. This is the ONLY example graded at this level with none higher! (PSA has two Speaker cards in EX-MT listed on its Population Report, one of which we know of was crossed over to an SGC holder but was never retired from the PSA Population Report.) This is a gem of a card, perfectly clean front and back, with four square corners and a brilliant image set against a deep red background (seven different background color variations of the set). Centered to the far left. The back has the checklist for the set. Advanced collectors of "E" cards will immediately recognize the caramel-card set designated as "E94" as a thorn in their side. While at a glance E94s may be easily confused with other caramel-card sets of the era (E93 and E98 specifically), they are an entirely different set, even though they use many of the same subjects and poses. Of the three previously mentioned sets, E94s are the most difficult. The E94 caramel-card set is usually associated with the George Close Co. of Cambridge, Mass. While the majority of the E94 cards do not have any sort of advertisement on the back, some have been found with overprints that make reference to this company. Caramel cards, of course, are rarely found in high grade. This is an extremely attractive high-grade example of the legendary Tris Speaker from this rare, early twentieth-century candy issue. Reserve $500. Estimate $1,000+.